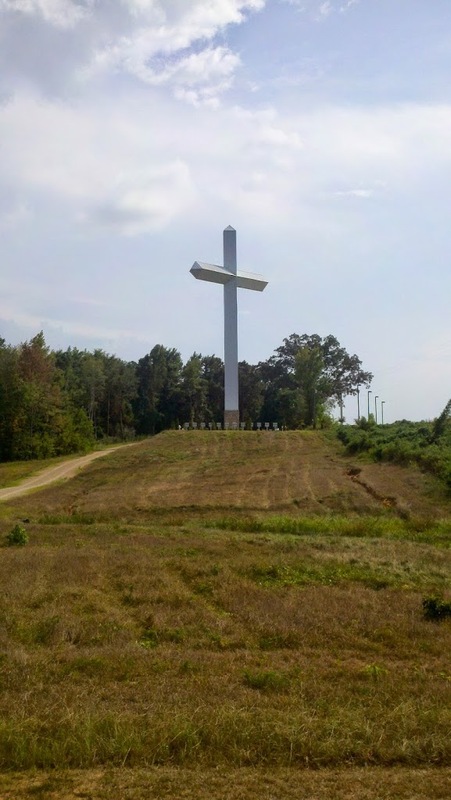 Just off the Winona exit on I-55 is a large cross. It has bothered Miss M for some time that the associated church is not visible from either 55 or Hwy 82, so this afternoon we went looking. Near as we could tell, there is not a church associated with the large cross– which is to say there’s no church on any of the few roads we drove. The first turn off 82 one makes, however, is onto Brother Johnny Walker Drive. That was a clue. Johnny Walker stood in the pulpit where he has been for most of the services at First Baptist Church, Winona, Mississippi, for over 14 years. What he was about to tell his congregation, most had known for some time, yet no one wanted to hear it. Parkinson’s Disease had progressed to the point that he would not be able to continue what the Lord had called him to do over 40 years ago. At the end of February, he would no longer be a pastor. Many eyes filled with tears, mine too. The “guy thing” wouldn’t let me get in line with wet eyes to shake his hand. So I bit my lip, took my wife’s arm, and walked quietly to our car. The “Why?” question popped in my mind several times that afternoon. Part of being a human, I guess. Brother Johnny is a terrific preacher. He can deliver a sermon with the best of them. He could have used First Baptist Winona as a stepping stone on his way to a church with thousands of members, not hundreds. But he didn’t He gave his all for this church for 14 1/2 years because that was what he wanted to do. Brother Johnny’s ministry extends past the corner of Church and Summit Streets. He is there for everyone in this community. His warmth and kindness, his message of Christ’s Love have meant so much to so many. From his early morning radio devotional, to visitations late in the evening, he has worked tirelessly, and for the last few years bearing the cross of illness. More on the Cross here— though how the intersection of 55 & 82 is the “center of Winona” is a fine question. Good for you for asking! WINONA, Miss. – (WCBI) The symbol for Christianity will soon stand tall in the center of Winona. After eight years of planning, the site at the intersection of Hwy 82 and I-55 in Winona is finally under construction. Wow. What a story! Though I still don’t understand why there’s a cross without a church. Could the key be “eight years” of planning? The WCBI is from 2013. Bro. Johnny “retired” in 2005. Probably what we need to do is search the archives of the Winona paper. It may be a tribute to him– likely as the street carries his name. THe church is still downtown but the cross would be visible to all on I-55. I wonder how long it’s going to take for someone to come along and tell them they have to take it down because it offends someone – and some how it violates the separation of church and state clause…. Well… . It IS Mississippi so the chances of that happening are lower than in, say, California. That said, someone wanted to put a similar one up near Brandon, Miss. and someone else complained so it didn’t happen.